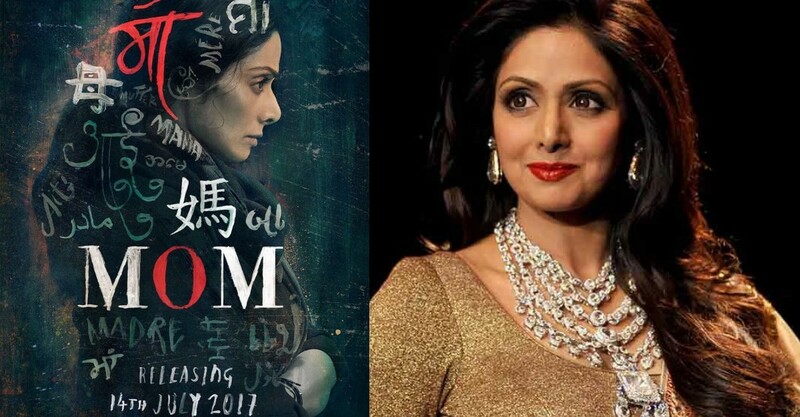 First Poster of 'MOM', Sridevi's Mysterious Look Revealed for her 300th Film! Actress Sridevi is back in the Bollywood game after a gap of 5 years. She made her comeback in 2012 with English Vinglish. Produced by her husband Boney Kapoor, she is ready to slay with her intense looks in upcoming film, "MOM"
Sridevi is one of the top actresses in Bollywood until now. She knows to take the best and ace the character. MOM is her 300th film in her 50 years of career. Isn't it Superb?! The first poster of the film shows Sridevi in black looking mysterious and adding depth. The title of the film, MOM is written all over her picture in various languages and forms. The film is said to be social drama set in the locations like Mumbai, Georgia and Hyderabad. Filmmaker Karan Johar also took to social media to appreciate the first look with a caption , "Her 300th film, 50 year career…my favorite actor….SRIDEVI…..in and as….MOM. The star cast of the film includes even more interesting and fine actors like Nawazuddin Siddiqui, Abhimanyu Singh, Akshaye Khanna and Vikas Verma. The music of the film is given by AR Rahman and directed by Ravi Udyawar. Sridevi will play the character of a mother and her children will be played by Adnan Siddiqui and Sajal Aly who are Pakistani child actors. The film is scheduled to be released on 14th July 2017.